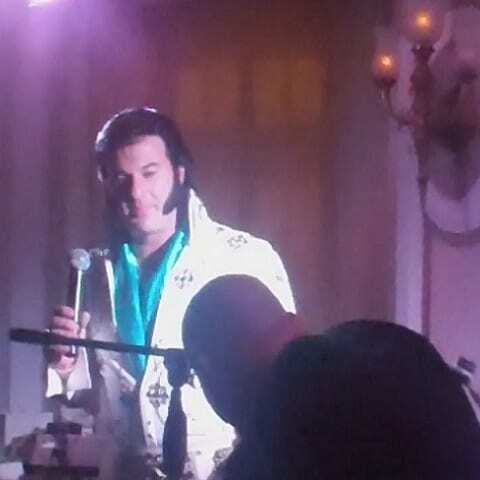 If you’re looking for an interesting evening, take a look at Elvis Impersonator Mark! Sure, it’s a novelty, an attraction but my what an ice breaker and a conversation piece at just about any special event. An Elvis impersonator, when done right is hard to beat. I have always loved Elvis and I love representing this professional who, if Elvis himself saw him, would be pleased. Blue Sky Atlanta Music & Entertainment has long admired this fellow’s skills and he is accepting dates solo or he can show up with his whole outstanding 5 piece band! Travel is not a problem. So get your favorite list of Elvis tunes out – he knows just about all of them: C.C. Rider, Loving You, I Want you, I Need You, I Love You, Love Me Tender, Jailhouse Rock – you cannot stump him! You can give him scarves to hand out with your logo or company name, we can even modify lyrics to an Elvis song to roast your retiring business associate. All done with a lot of class! Some themes to think about that Elvis might be a great idea for would be: a birthday party, an anniversary party, a rehearsal dinner and retirement dinners. I have seen very few Elvis impersonators that can even come close to this man!